Potholes litter the secondary roads. The broken up surfaces are being destroyed by large trucks and tankers. Taxis from bus stations are expensive (there’s no Grab … or Uber!). They don’t have meters and fares are “negotiable”. When you don’t know where you’re going and all you want to do is get there, you are a perfect target to be gouged! There may be some cost justification for the high prices in that gas is not cheap (1USD / litre) and keeping the vehicles on the road is expensive. On the other hand, they have long since been fully depreciated … about 40 or 50 or 60 years ago! For our internal travels we initially used Viazul. With the incident we had at the Havana bus station and our later good collective taxi experiences would not use them again. The first impression of the inside of the bus is “no one cares”. With gaping seat pockets filled with discarded wrapping papers, crumbs on the floor and stained seats. The buses are as comfortable as you can expect from a low quality Chinese bus on a poorly maintained Cuban road. A lack of organisation and systems characterise the travel experience. Both have nothing to do with sanctions (or an embargo) but are symptoms of pure incompetence and sloth. Bus travel is quite slow with the occasional arbitrary stop to pick up or drop off a passenger (a friend?) or stop at a roadside stall to buy some biscuits. Despite hearing of some unpleasant experiences we had no problem with the two collectivo taxis we took. 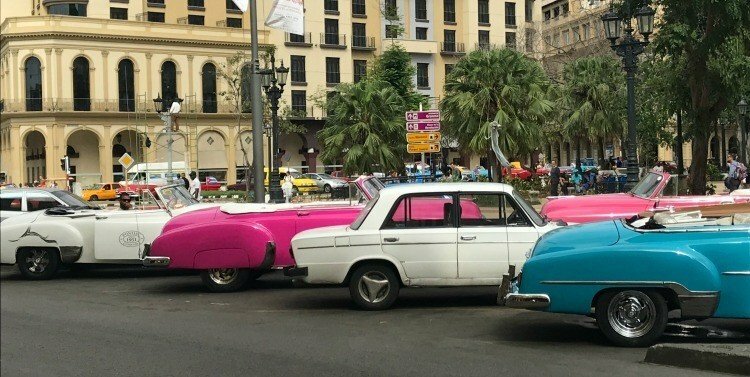 From Santa Clara to Cienfuegos (3 people about 70 kilometres CUC10 per person) and from Cienfuegos to Havana (3 people about 250 kilometres CUC20 per person). Their advantage over bus travel is that they operate from door to door. There’ s no having to negotiate a taxi to and from the bus station. No getting to the bus station at least half an hour before departure. No confusion in the bus station with no signage or intelligible announcements. So for me they're a “win” especially after our Viazul experiences. In a bright blue 1950s Chevrolet. The windows wide open, a high pitched diff whine and a slight clutch shudder. Sitting in the back with a slight exhaust smell and the suspension bottoming with every pothole. Going at full speed and then freewheeling the downhill sections … without the diff whine. Hooting as a warning and as a “thank you”. Hand signals - racing other collective taxis and jamming on brakes for horse carts. All part of the adventure and memories of car travel from the distant past.